They not only deserve but require, if grown at all, a permanent home in the garden, because once planted they are essentially impossible to extirpate (though not actually “invasive”). We have set aside for them an area outside the garden proper (they produce tall, willowy, not unattractive plants—in fact, some grow them as ornamentals). They don’t require fine garden soil—in many areas, they grow wild as “weeds” (naturally, they were a staple food of native peoples). If you want to pinch pennies, you needn’t buy sunchokes from a seedsman—buy some at your local grocery when they appear, cut ’em up, and plant ’em. You can leave them in the ground right through winter, digging some as needed—they are hardy to -50 degrees (one expert source says “Jerusalem artichokes are available year round, but are at their sweetest from fall through winter”). Indeed, like most root vegetables, they are much improved in flavor by at least one haevy frost. One source claims that there are today perhaps 200 “types” of sunchoke (presumably meaning cultivars). 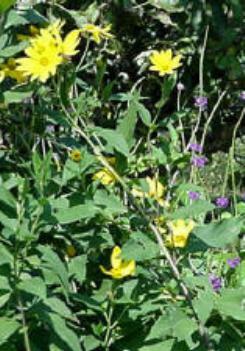 The 2012 Seed Savers Yearbook showed 63 types offered, including a generic “Jerusalem Artichoke”. Nonetheless, by no means do all seedsmen even carry sunchokes, and, of those that do, few name a variety. While all types probably grow comparably, at least in home-gardening terms (and, being on dedicated ground, their growth time is immaterial), and presumably (dangerous word there) have much the same culinary quality, there is an important distinguishing point for cultivars: smoothness. The older sorts are very knobby—looking a lot like ginger—and correspondingly a major nuisance to peel (though it is by no means clear that they need peeling for most uses); there are now several types that are quite smooth (or at least fairly non-knobby), and thus perhaps more desireable. One source said that “some say [the smooth types aren’t] as flavorful as knobbier types”, but we did not find any such comment anywhere else. Cultivar choice is important, because barring catastrophes (such as a vole invasion), what you plant is likely what you’ll have forever. Since we use these things a lot (when we have them), we really want one of those smooth, easily peeled sorts, which lets out several common varieties. Also, for what it’s worth, one source at least claims that the red types are distinctly sweeter than the plain ones (the red coloring agent being responsible); even if true, whether that’s a merit may depend on your opinion of “sweetness” per se as a measure of merit in vegetable eating qualities. Offerings of sunchoke tubers are very minimal among U.S. seedsmen (and when they have ’em, it’s usually only one kind, and that not a named cultivar). Fortunately, there is one big exception to that, and it is the 27 named anbd described varieties at Oikos Tree Crops (no, chokes aren’t trees: but Oikos has an amazing selection of growing things, including some we’d bet you never even heard of). You can review their offerings at leisure and make your own pick (ours is the Gute Gelbe, chiefly for its smoothness). Once again: whatever kind you first plant you will have forever—so pick with care! If you have to pass up a season to wait and get a kind you want, do it. You normally plant once for a lifetime. Planting is rarely if ever of true seed, but rather of cut-up bits of “seed” tuber, as with, say, potatoes. You can either plant these early or late. Conventional advice is that you either put them in when the ground has just thawed enough to be worked, or when the ground is just about ready to freeze. You harvest first, then replant enough of the harvest to make the next crop. Because these things overwinter anywhere, and are—like most root crops—improved by frost, the best bet is the early (spring) option. Regrettably, most seedsmen ship well past that time, so your first planting will probably have to be determined by that. But once they’re in and growing, wait till winter has passed to harvest and replant; don’t get greedy and take them in the autumn. The fact is, though, that even cold-hardy sunchokes don’t germinate till soil temperatures reach about 45° or so; it thus seems that there is no special virtue in breaking through ice (figuratively speaking) to get them in the ground in spring. They’re going to be in-ground for a year anyway, so don’t rush it too much. They do take a while to grow fully—minimum 125 frost-free days, one source says—but there’s still no rush; you could plant out as late as May 1st and still almost surely make that quota. Just keep an eye on soil temperatures (you do have a soil-temp thermometer, don’t you?) and when it gets 40° or so, go to work. Sunchokes are amazingly tolerant of all sorts of poor conditions, but really must have full sun (consider their name and botany). Still, it helps not only them but you—since you have to dig the bed well to harvest them—to initially make the bed as friable as possible, mixing in lots of organic matter and, if necessary, actual sand as you deep-dig it. Cut the tubers you receive from your seedsman into small pieces; be sure each has at least one and preferably two “eyes” (like potato “eyes”) on it. Do not allow your seed tubers to dry out before you plant them. You will probably get an average of a dozen seed-tuber pieces from a pound ordered, so order accordingly—if you want to be really conservative, figure on 8 pieces the pound (which would make an average seed-piece weight of 2 ounces, a figure some sources mention). If you have dug the bed deeply and amended the soil—if necessary—with some organic matter so it is not terribly heavy, plant at a spacing of 15 inches. Some sources suggest planting at a depth of 3 to 4 inches, but in well-dug soil set the seed-tuber bits 6 inches down. It is said that they can come up from as deep as 12 inches, but why press? Water the bed well but occasionally: perhaps once or, in summer, twice a week. At the outset, while the plants are emerging and are still small, weed scrupulously, but not too deeply. When once well into growth, sunchokes compete very well, and you can let the bed go to weed if you’re lazy, but as seedlings they are vulnerable. Let the plants go. If you want to harvest a few very early tubers, you can, but it’s kind of a waste, because they’ll be small. Just leave the tubers in the ground right through the winter, then dig them up as soon as the ground unfreezes enough in spring: the tubers will taste even better after fully overwintering. As with potatoes or other deep-root crops, take care when digging not to damage your crop. You will have to dig pretty extensively, both vertically and horozontally, to find all the tubers (which is why it’s nice to have really friable soil). When you’re as sure as you can be that you have found all the tubers for a given plant, leave a small piece—about the same size you originally planted out—in the hole at that original 6-inch depth, then fill in the hole. You have now both harvested your current crop and planted your next season’s crop. It is said that you can expect from 2 to 5 pounds of tubers from each plant. Under ideal conditions—31° to 32° F. and 90% to 95% humidity—sunchokes can be kept for months; but in the refrigerator within days they go soft and become unattractive for any fresh use where their crispness is wanted. So use a few right away for any fresh use you want, such as salads, and cook up the rest for freezing (they make a superb cream soup). Sunchokes are occasionally, and wrongly, described as “invasive”. As explained above, they do not “invade”—that is, spread beyond their planting—but within their planting they are nearly ineradicable, for the very least bit of tuber left below ground will invariably sprout a new plant in spring. If, for some reason, you feel a need to wipe out your planting (as, for example, to relocate the bed), about the only reliable way is the long-term method: ruthlessly mow down every sunchoke plant as it appears, wait a season, and repeat, and repeat, till no more come up. Sunchokes are another member of the useful Asteraceae family, the asters (formerly the Compositae), which also includes the lettuces and many lettuce-like plants; they are closely related to sunflowers. The ancestral sunchoke evolved along the eastern seaboard of North America, from the Gulf north up to Nova Scotia. Samuel de Champlain encountered sunchokes growing in a Native American vegetable garden on what is now Cape Cod in 1605; he thought they tasted like artichokes, and the name apparently stuck. Native Americans called them sun roots; they are one of the many new-world foods the European settlers were given by the natives, and quickly became a colonial staple. When cultivation of the plant had spread to Italy, arriving sometime before 1633, the Italians dubbed it the girasole, the “turn [gyre] to the sun [sol]” plant. It is generally believed that girasole was corrupted to “Jerusalem”, the “artichoke” part coming from Champlain’s early and ill-conceived comparison. Sunchoke cultivation reached England in 1617, and Germany by 1632. An early edition of the Oxford English Dictionary mentioned “Artichocks of Jerusalem” in 1620. Since their original flush of success in Europe, sunchokes have had an up-and-down history; it has been more down than up, owing to the immense popularity and success of that other new-world import, the potato, the two competing, basically, as a source of dietary starch. But the sunchoke persists, and at times has new flares of popularity. In recent years, there has been commercial interest in sunchokes as a possible source of distilled fuel (alcohol-like); that interest included one of the century's larger pyramid-scheme frauds—involving sunchoke seed tubers—which took in many farmers. Sunchokes' carbohydrate content is entirely inulin (not insulin), and they are thus supposedly safe for diabetics to eat (but in many people inulin can cause some flatulence). It was last modified on Sunday, 3 February 2019, at 06:56 EST.